"The Center Theater, opened in 1915 as the Arcade Theater, was the last standing of the 12 downtown Jacksonville, FL movie theaters that thrived during the early 20th Century. With its collapse in the early morning hours of September 5, 2002, the only theater from the era that remains is the Florida Theatre. The two-story building opened in 1912 as a vaudeville house and was converted to a movie theater in 1915. 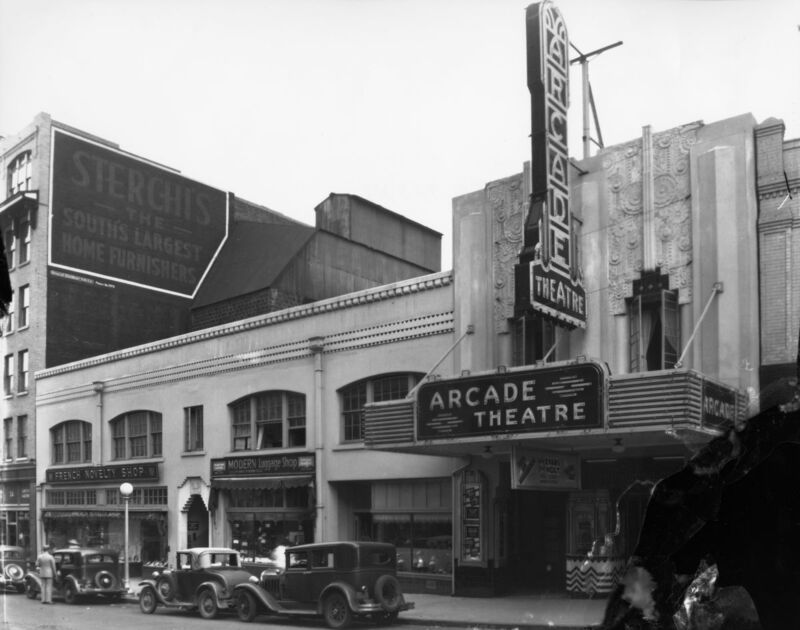 It was initially named the Arcade Theater because of dual entrances and box offices on Adams and Forsyth streets that were connected by an arcade-type hallway, according to Times-Union archives. The single-screen movie house featured silent films throughout its early existence when movie-going was a high society dress-up event. At its pinnacle, the theater could seat up to 1,580 viewers at a single showing. Under new ownership in 1960, the theater was renovated and renamed the Center Theater. Over time, growing multi-screen theaters building adjacent to malls in the suburbs overshadowed the single-screen movie houses downtown. By the late 1970s, most of the downtown theaters were closed and the Center Theater was struggling to remain profitable by showing kung fu movies primarily to black audiences. The movie house closed on Jan. 2, 1983, after showing two last martial arts flicks. Preservationists were hoping some of the theater’s art deco style facade could be saved before demolition. Cynthia Neal, owner of a business that specializes in the redevelopment of downtown historic buildings, said she hoped several architectural elements were not lost with the rubble. ‘Safety is first. Then, if we can preserve any of the historical features of the building is my second concern,’ said Neal, owner of revitalization company Southworth McDowell. A representative of Center Partners Limited, the owner of the theater, said immediate plans are to safely clear the area, and they have not made any decisions about what the property will be used for in the future." The Arcade Theatre was located at 32 W. Adams and it seated 1580 people. First Run. When the theatre became the Center — the first film was BEN HUR. I saw ‘Ben Hur,’ “West Side Story,‘ and 'Who’s Afraid of Virginia Woolf’ at the Center Theater—and many others in the 50s and 60s. The arcade was cool to a youngster—you could come in off two entirely different streets—and I remember (I hope accurately) that both box offices were functioning in the 50s. After the 1960 renovation, the Center specialized briefly in ‘road show’ attractions, that being one of the dumber attempts to compete with television. ‘Prestige’ movies like ‘Ben Hur’ and "Flower Drum Song' were held back from national release for weeks or months, then opened in smaller cities with reserved-seating and other kinds of fake urban elegance. Ironically, what really did enable movies to compete with television—‘adult’ material (at first, dirty words)—arrived with ‘Who’s Afraid of Virginia Woolf?’ in 1966. My friend and I made a point of going to see that, at the Center, on the afternoon of the first day, for fear that the authorities would shut the movie down, as had happened elsewhere in the South. The renovation ruined whatever architectural distinction the theater had. The Center was ‘modern,’ comfortable, and bland. The description mentions movie visitation as a “high-society” event. I would argue it was anything but — movie-going was, and still is, a democratic pursuit and at the time (as it is today) ticket prices were (are) much less than those granting admission to legitimate theaters. I agree, though, that audiences dressed up for the occasion, but only because of the inherent societal microcosm of a theater. People you know might see you and be impressed by your new hat. Also, it’s simple imitation by intimidation: the interiors were often elaborate, thus the audience tended to oblige.